Our last stop on our five month walkabout was the same as our first had been. We were back at Colonial Airstream in Lakewood, New Jersey. We had a laundry list of repairs and fine tuning to take care of. One downside of never having a practice trip to break in the Airstream, but simply heading out, was we had no shakedown trip. We discovered issues as we traveled and slowly assembled a prodigious list of things to address. We would spend two nights and the intervening day waiting to become ship-shape. This is in no way a negative about Airstreams, Colonial or the Airstream manufacturer. Even in a travel trailer with no engine to worry about, things are bound to break or go wrong and need attention. The issues we faced were far fewer than those potentially faced by Fifth Wheels with lots of pull outs and moving parts or even the giant Class A’s with their amazing amenities. Our trailer is a simpler creature. It has fewer bells and whistles and, therefore, fewer things to need repair. But there is inevitable wear and tear. Our home base was a pet-friendly Comfort Inn. We had stayed there before. It was clean and the staff was very nice. Located about 20 minutes from Colonial Airstream, it is the only pet-friendly motel in the area. We dropped the Airstream at Colonial on Tuesday evening. The drive from Jersey Shore had been wet and grey and the parking lot at Colonial was a succession of small lakes. We were feeling sad and bereft at leaving our comfy trailer. Those feelings were somewhat balanced by the thought of a long hot shower in a private bathroom. Ah, that would be nice. We got ourselves checked in to the Comfort Inn. There was plentiful Wi-Fi signal and Dakota seemed pleased when we brought his bed in from the truck and, of course, his yellow duck and his water and food bowls. All the furnishings that a furry dog could need or want. With no kitchen at hand, we were forced to go out to dinner. I had been hankering to go to a Longhorn Steakhouse for weeks and there was one nearby. We loaded Dakota and his bed back into the truck and headed over through the rain. Dinner out in a restaurant, how exciting!! A steak, a little red wine and all was fine. For the next two days we would need to entertain ourselves. The next morning was grey and rainy and we hung out in our room. Then we made a stop at Petco. Dakota was properly satisfied with the 35 lb. bag of kibble we picked up. We have a storage container in the back of the truck. Periodically, we refill the container of kibble in the trailer. We had pretty much run through our inventory so it was good to top that off. We enjoyed a lunch at Ruby Tuesday’s. We hadn’t been to one in years. As Peter put it once so nicely, we don’t eat out often, but we tend to patronize restaurants owned by sole proprietors. The day stretched before us. We still had a whole afternoon to kill. I was secretly hoping they would call from Colonial and say, “Surprise, we’re all done…” But that call never came. We thought about going to a movie, but didn’t want to leave Dakota in the truck for such a long time. We ended up driving around looking at public libraries. We thought we could go in one and catch some Wi-Fi. Sadly, the local libraries all looked terribly uninviting. We finally went back to the room and hung out. We were so stuffed from lunch, we ended up skipping dinner and eating unhealthy munchies in the room. It was still grey and rainy the next morning. This was getting ridiculous. Once again we hung in the room until checkout time. We drove over to the shore. Jim’s longest term friend, Bruce, had a family place in Mantoloking so we drove from the south to the north checking out the beach towns along the way. It looked like things had been pretty well cleaned up after Superstorm Sandy. Jim had located a state park not too distant from us and we thought a hike might let us stretch our legs. I was still secretly wishing the folks from Colonial would call to say we were all done. This waiting was really getting on our nerves. We were both anxious that we get under way heading home as early as possible. Neither of us wanted to get caught in the traffic around the Garden State Parkway and the city. The Double Trouble State Park was billed as an outstanding example of the pine barrens ecosystem. Despite its frolicsome name, they were clear online that they had a lot of ticks. Nevertheless, it was the only game in town. This park is a restored village. Originally, they harvested and shipped cranberries. They did claim to still have a cranberry bog and I had always wanted to see one. We wandered around the park looking for a map and the bog. If I had only wandered over to the little white house which said ”Restroom”, all would have been clear. Unfortunately, I only did that after we tried unsuccessfully to locate the cranberry bog. And there were the trail maps… And speaking of locating, I picked three ticks off Dakota’s paws. Yuck. Next we stopped by Colonial just to let them know we were there. They said we might be done about 2. That was excellent news. We were hopeful. A delivery man wandered by with a stack of pizzas. We asked him where the restaurant was and we headed there for some comfort food. There was a long table set up in the restaurant and shortly after we sat down about 20 older gentlemen trooped in. This was clearly a fairly regular gathering and all were in fine spirits. We entertained ourselves eavesdropping on their lively conversations and jokes. They had known each other for a long time and it seemed like a really good group of fellows. The pizza was excellent. Still no call. It was after 2:30. We had no motel. We had nowhere to go. It was still raining. We couldn’t eat another bite. We were out of entertainment ideas. About half a mile from Colonial was a bowling alley. We toyed with the idea of going in to bowl a game or two, but we had no heart for it. In a pathetic display of lack of imagination, we parked in their large parking lot and Jim snoozed while I knitted. We weren’t the only ones. There was another truck parked in the lot just whiling away time for some reason as well. Finally we headed back to Colonial to see what was happening. It was 4:30 and we thought they would be closing for the night at 5:00. We were completely impatient to be under way and secretly concerned that they wouldn’t finish and we would need to stay another night. Happily, they were almost done. They had ticked off every item on the to-do list except for one. They had determined that our antenna had failed. That explained why halfway through our sojourn we were no longer able to get television reception. They didn’t have a new antenna on hand so we would need to deal with replacement at another time. Amazingly, we were charged not one thin dime for the two days of labor and parts. It was all covered under the warranty. That was a very happy surprise. Life doesn’t usually work that way. We hitched up and headed out of the Colonial parking lot for the last push homeward. Very clear in both of our minds was the memory of leaving that same parking lot at the beginning of our trip. So much had happened. So many miles had been traveled and we were now so much more confident and seasoned as Airstreamers. It was a very satisfying moment. The rain continued off and on as we drove northward on the Garden State Parkway and then picked up 87/287 and crossed into New York. As we passed our former home town of Rye Brook, we mused that we would be home now if we still lived there. But, no, we had another hour and a half of driving ahead of us. It was well after dark and 10 p.m. when we made the turn on to Grantville Road. We were bone tired and anxious about the final hurdle. 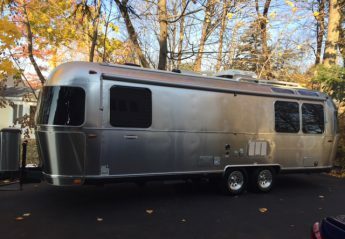 While we were on the road, a parking pad had been built for the Airstream next to our house. We would be backing our trailer into an unfamiliar pad in the pitch dark. Ironically, this was perhaps the most difficult maneuver we had faced since way back in January when we needed to extract the frozen Airstream from the snow and ice in our yard. After over 8,700 miles, here we were back wrangling the trailer in the yard. After two hair-raising attempts at backing in, Jim almost gave up. I was shining a tiny flashlight to help illuminate the target. The pad wasn’t quite wide enough where we needed some extra room and the ground beside it was very soft. We were falling down tired and had begun to try to think where we could hang up the trailer for the night when Jim gave it one last try. He gunned the engine and forced the trailer back on to the pad. Thank heavens. We locked the truck, left the trailer hitched and headed directly to bed. We were home. Our trip was now officially done. In the time since we arrived back home, I have thought about an appropriate coda. What insights would I share as a conclusion to our voyage? How would I sum up what this trip meant to us? We had a dream about venturing around our country with an Airstream. We were so incredibly fortunate, and determined, that we were able to live out this dream. We learned so much. We got to know a pretty good swathe of the south and west of our country. We feel a connection to this land we could never otherwise have felt. Florence, Tupelo, Lost Maples, Pedernales Falls, Ochlockonee; these places and memories will live in us as long as we breathe. We met so many people who were living their lives in other places, under other circumstances. These people may well have held different beliefs than we and, yet, we could share the experience of travel and discovery. On a macro level we may have felt very differently about our respective worlds, but on a micro level, we could and did share much. We are, after all, humans with hearts and souls and dreams and disappointments. Ultimately, we all want the same things in life. Being on the road together brought us closer than ever. We were a team. We were a team of three in many ways, but certainly Jim and I were more reliant upon each other than we had ever been before. We needed each other for companionship and for the daily tasks at hand. I think we learned to be kinder and more accepting of each other. We were traveling through a great land in a very small space. There was so much to share and everything meant more to us because it was shared. Being home was an effortless transition. We were happy to be back in our familiar setting. We were also very happy to have our Airstream just outside the door. Being home coexists with the promise of future travel and adventure. Sometimes we just go out and spend time in the trailer. It is so familiar and comfortable. Dakota grabs his yellow duck and curls up on his bed. He often smiles and it is easy to see he is relaxed and happy to be in the trailer. So are we, we are happy to be in the trailer. There will be future adventures. We will head out again. We saw much, but we left even more to be discovered. We have a short trip already planned for the near future and the glimmer of a grander undertaking farther into the future. Returning home was not a conclusion, it was simply the next beginning.